I did it. I GOT A CONTRACT. | Save. Spend. Splurge. Home › Money › I did it. I GOT A CONTRACT. I did it. I GOT A CONTRACT. And it is for slightly more money than the one I gave up to stay local and at home with Baby Bun. Guess things work out if you just be patient, right? Anyway, here’s my preliminary budget for how it’ll all break down. So this is what I definitely need to spend. I flirted with the idea of not buying a car and being cheap, but NOPE! I am buying a car. I could take the metro to get there, but that involves 2 buses that come once every hour or so (and only between certain hours, not all the time), and switching trains. It takes about 20 minutes to get there by car, but I reckon by metro, it will be at least an hour if not an hour and a half, depending on if I miss one of my connections or not. Also, I am not a fan of being outside during the dead of winter in Montreal and on foot. It could be cheaper if Daddy stays at home with Baby Bun but it all depends on if he gets a project too. I also put a blanket “$500” for “Other” expenses because I don’t know what it’ll cost for Baby Bun going forward in daycare (more disposable diapers for sure). For instance, we will definitely have to buy a Vitamix blender to make his pureed food and I am SURE I will be buying other things I haven’t thought about. 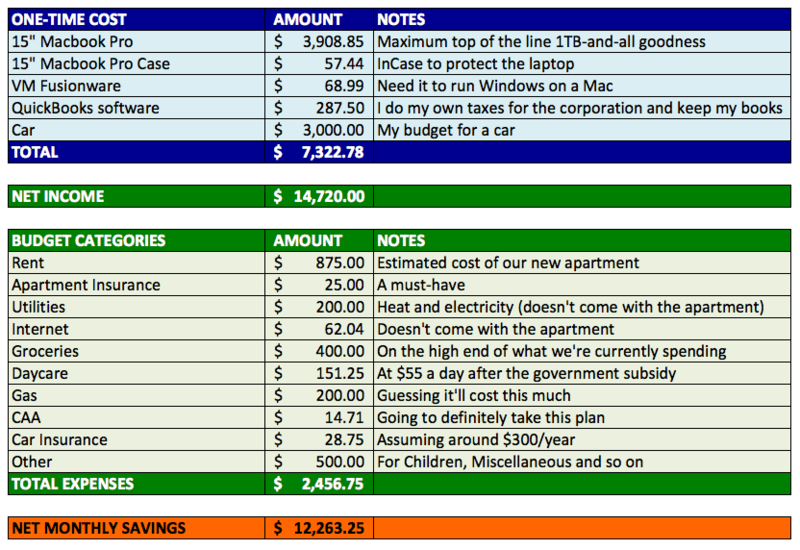 I am looking at roughly $2500 a month in expenses. The good news is that when I work, I don’t spend money. After taxes, the good news is I can bank about $12,250 a month which means I will hit my $250,000 net worth goal for this year, and if I squeeze and scrimp a little harder, $400,000 by the end of next year. Even if I hit only $300,000 I’d be happy, but I think I’d like to aim for $400,000 or more. We are considering buying a condo. We’re kind of sitting around, looking at the market, assessing what’s coming up, what’s been on sale for a while, and what they’re asking. Our budget is $400,000, which means we each have to stump up $200,000 to make it happen. BF is paying his half in cash, and depending on how I finagle my finances, I will too. Actually, we kind of don’t have a choice in paying cash or not because as freelancers you need to show income statements for the past 3 years to get a mortgage and my income has been erratic, so I have nothing to show for it. I will have the money to put up $200,000 in cash to buy a place, my credit score is decent, but I can’t score a mortgage because my income fluctuates. We’ll see. I may take out a line of credit instead if the rates are low so that I am not completely out $200,000 at one shot seeing as the market is still making more than 3% these days. Love this? Please help me share it! Ask Sherry: How do I work? Ask Sherry: What is the best investment you’ve ever made? Congrats on the new contract! And I loooove me some budget breakdowns. Good luck! Congrats! You will do great! I’m so impressed that you have managed to avoid lifestyle inflation, do you have any tips? My trick is to try and make a lot of cash so I can go on vacation and do things/buy hinges when I am not working. I have had significant lifestyle inflation since I’ve gotten out of debt. Well.. 🙂 Within my means.. you wouldn’t say that if you saw the month when I bought a Burberry coat on a whim!!! They were amazing. A la Folie makes the best Macarons in Montreal and their pate a choux isn’t bad either. Congrats! So exciting. The Vitamix rocks – we use ours frequently. Also, the fact that your child care is subsidized like that is very generous. Certainly helps reduce the expenses. Yes BF is excited about the blender. I really want it for smoothies. Without the subsidy it would be very expensive but still worth it to work. Congratulations! I think things work out as long as we stay open minded and have faith. I completely understand not wanting to spend an excess amount of time commuting, especially since you have baby bun to tend to! Re: condo — price-rent comparison, crash, rabble rabble rabble, etc. etc. You have to show a few years of tax returns but lending is still pretty loose so I think they’re ok with erratic as long as it’s there and averages out to their ratios, but the only way to know for sure is to actually try. Compared to renting it is the same if we find properties around the $350-$400 range because we didn’t realize that rent went up..
Well my income has been pretty odd so it could be a no. I’ll ask around out of curiousity but I’m not worried as I will likely have the cash, just not all at once. I’d be OK with paying interest if it paid off in taking out my money at a lower tax rate (spread out) instead of a lump sum. This is great news. So good you are going to sock it into investments too. It is amazing how investments in the stock market grow and grow, when you add any windfalls along the way and save all the income. Real estate is an investment, and house would be a much better investment than a condo. Real estate produces income as well — e.g. have a rental unit, plus you can rent the whole house if you want to move, travel, or just save money. Or rent the main house and live in the rental unit. The expenses can be deducted from the income. As for a mortgage, I got one when unemployed from my credit union. Don’t assume you can’t get a mortgage. Don’t worry about a big mortgage, I have a huge one, but my rental income takes care of it. Put down a decent down payment but not too much as the leverage of a mortgage makes you way more yield. Real estate is not the same in Montreal as in Vancouver, where houses keep going up and up (although not every year) so I am not sure what I would do if I lived there. Condos are not so great an investment, and you have to prepared to commit for a long time to make money on a condo. I bought one (pre-sale) in Vancouver a few years ago, sold it a few years later, at $6,000. less than I paid after deducting the realtor fees and staging costs. But I did break-even on cash flow (rental income less expenses) and owed $50,000 less on the mortgage than I started. I would not do that again even in Vancouver. I’ve owned both houses and condos previously and only made money on the houses. As long as you are commuting so far anyway, why not buy a house? I am not interested in a house at all because I don’t want to buy a wooden shack for the price they’re asking. As for a condo it’s because I’m planning on living / retiring in this condo forever. It’s a “forever condo”, and I don’t want to invest in real estate to make money, I want it as my primary residence until I die. I will ask about the mortgage but I’d be curious what interest rate they offer. If it’s too high, I’ll pay it in cash. Houses are also a million (starting) where I want to live. I don’t want to pay a million. It’s just a place to live. You are a freaking ROCK STAR!! Congratulations on your new contract. That’s fabulous! The pay looks great and your budget is lean and mean. I agree, you’re going to want the car with the baby. Can you say what you’ll be doing? Congratulations! About the car – once you are away from your baby for hours at a time, you’ll want a way to get back to him/home in a way that you can control. If he gets sick at daycare or has an ear infection in the middle of the night – trust me you want your own transportation. You can always go back to taking transit a few days a week if you really want to save money. Plus it’s nice on the weekends to be able to do errands and outings with a car. Congrats on the contract! Still, I am definitely getting a car because the commute will kill me. Best of luck on that condo search too. How loans work is ridiculous. Just out of curiosity, how is the daycare expense calculated? Do you anticipate that Baby Bun only needs to go to daycare a couple days a month? Probably not. I need to save up for that condo… We may not get a loan at all if I pay in cash. I may give my bank a call anyway and see what they say out of curiousity. Yay! Now you can get all the things on your wish list from your post a few days ago! Supposed to be pay off… I don’t even know how to party off. Lol. And the sweet feeling of income is glorious! And what a contract it is!!! Congratulations 🙂 I’m so glad it all worked out in the end. Thank you. Yes.. it was very nerve wracking, stressful and frankly, not something I want to repeat. I’ve been through the same after being downsized 9 years ago. Very hard! Felt like I was heading down the river over Niagara Falls. But now I have built up my nest egg to a level where I get enough income to travel, and the rental income off my house covers all the mortgage and other expenses, and I am retired. Thanks!! I have been a bundle of stress ever since I turned down the one contract so it is a relief to get this one. I used a basic immersion blender to puree veggies and other stuff for baby food, and it worked really well. ooh ok =). Yeah I just meant if it’s just for baby food, you can just get a $30 stick blender! BF has his heart set on this Vitamix.. 🙂 Can’t dissuade him. READS: All my book recommendations. Keep up to date with me! Be the first one to find out when we have new content posted! I am a wealth-obsessed, style-focused, minimalist. 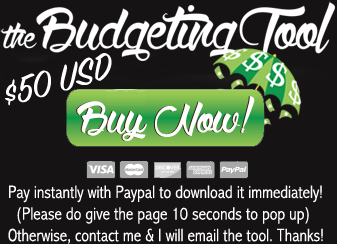 I got out of $60,000 of debt in 18 months with The Budgeting Tool which I now sell online and donate its net proceeds to charity, along with The Investing Tool. I've also authored two books: Start a Blog Like a Boss - Making $1000 USD a month & Invest your Money Like a Boss - In 4 Hours a Year. I earn like a princess when I work but am trying hard to live like a duchess instead by not spending all of it. The rest of the time I relax and enjoy the time off by traveling, although traveling has been on hold lately with the arrival of Little Bun, my rambunctious, ever-hungry little boy. ©2019 Save. Spend. Splurge.. All rights reserved.